Innotech’s high performance Direct Digital Controllers (DDCs) are rugged, built to last and designed to enable precise control in even the harshest of conditions. This series of Direct Digital Controllers consists of the Genesis II and the Genesis II Mid Point Controller (MPC). These controllers are fully expandable with Remote Expansion Modules (REMs) allowing up to an extra 120 points. Innotech offers a range of powerful and intuitive software tools that allow you to quickly and easily program, control and monitor your control system locally, remotely or via the internet. The best dollar-per-point DDC range on the market. 20/20 IOs (non-expandable). Suitable for small/medium chiller plants and air handling control. Large processor DDCs that are fully expandable allowing up to an extra 120 points. Suitable for large chiller and central energy plants. All of our scalable and intelligent peer-to-peer DDCs are intuitive, highly accurate and fully programmable and with easy-to-use operator interfaces. 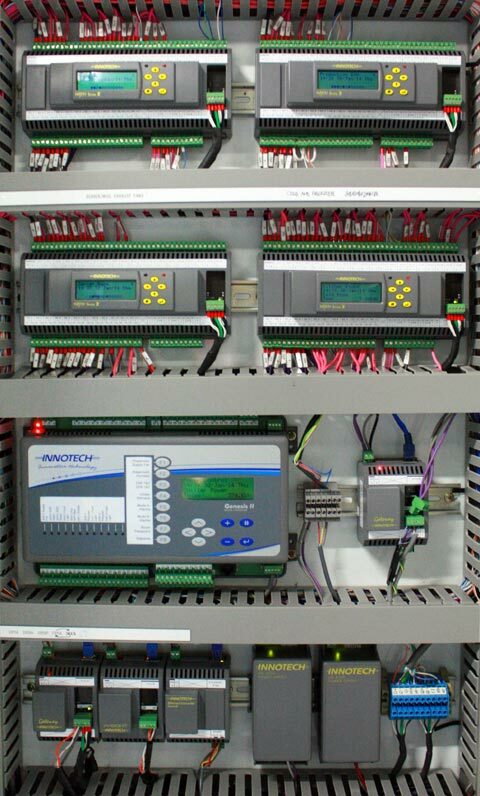 To ensure full product reliability, quality and compliance, all Innotech controllers are subjected to stringent power-up tests prior to leaving our manufacturing facility. Each having the ability to exist on the same network (refer to the system architecture diagram) and pass information peer-to-peer. Innotech’s exciting Genesis and Maxim Series control systems are a powerful, integrable and easy-to-use solution for control of HVAC and Process Systems.